Purchase the Wine Minimalist Kit! 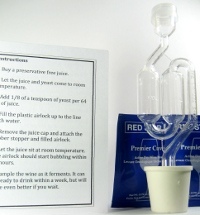 Order your wine making kit for $10 with free shipping. Enough yeast to make 10 gallons of wine. One reuseable stopper and air lock that fit most juice containers. We do not ship outside the continental United States. You must be 21 or older to order. Your order will ship within 3 business days.